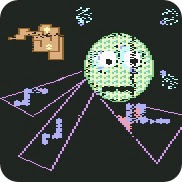 Alright... the first cover compo by C64.sk is over and now you can download the finalists tracks in mp3, sid, prg.... The results will be published soon. Using a similar setup to the previous post, it is quite simple to build / add a sequencer section for standalone operation. Furthermore, if this sequencer is clocked using an external source (such as... LSDJ!) then it can be quickly synchronised to other sources of music. The program Cynthcart is running on the Commodore 64. The filter is usually controlled by a paddle control in real time. However, it is easy also to sequence the filter frequency using some cheap IC's. In this case, the speed of the sequencer is controlled by the master clock sync output from LSDJ running on the Gameboy. I have been recently enjoying the exquisite stuff that Sebastian Tomczak is posting through his little-scale blog, lots of cool chip-data-hacking action for your brain. 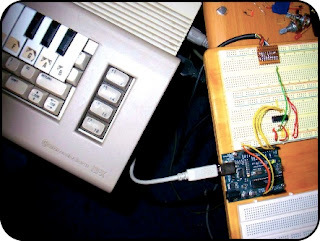 One of the latest is this great arduino based idea, a software / hardware combo that allows for control of the analog filter inside a Commodore 64 that is running Cynthcart from a host computer (eg, Macbook, PC). 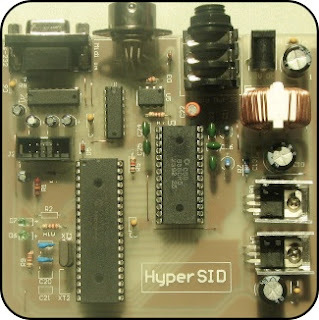 The hardware is very simple, and is based around an Arduino board that is using a bit-banging SPI technique to write data to a 100KΩ digital pot. 1) He created his own chip. Together with his demoscene crew Akesson made the actual chip that plays the sounds and music: The Hardware Chiptune Project (2007). In a few days they made a microcontroller (8 Mhz CPU, 8kb ROM, 2kb RAM), programmed the sound generator and the tracker-software to finally make the music. The result is something far less minimalistic than Tristan Perich’s 1-bit music (2006). 2) Åkesson made a melody search engine for the C64 music collection HVSC: SID Theme Search Engine. The HVSC contains most C64-songs ever released, and the fileformat is essentially open source - containing all instruments and notation. That is why Åkesson could generate a database with the notes from each channel of almost every C64-song - a process which took several days eventhough using an emulator. But to get back to the “classical” music in SID-style. There are several compositions: Allt Under Himmelens Fäste originally by the legendary demoscener Mahoney, Romance originally by Chopin but now in SID+piano version and, Fratres originally by Arvo Pärt. There are even more but my favourite remains the 7xSID-song Förklädd Gud. The thing that gets to me is that it’s rare to hear chipmusic so carefully crafted. The sounds are 8-bit but the assembler dynamics of 7 SID chips (although emulated) makes it sound more like Wendy Carlos than Rob Hubbard. This is an interesting song to keep in your pocket when people blame chip music for being simplistic. So check out Åkesson’s website - there are lots of interesting projects and lots of information and downloads aswell.